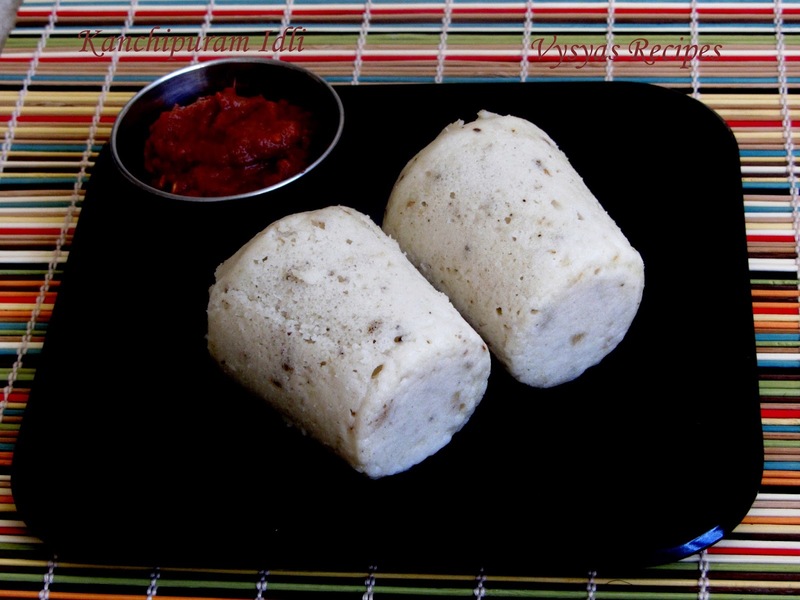 Kanchipuram Idli is a traditional South Indian Idli. This Idli is an flavourful, aromatic idli, spiced with cumin seeds,pepper seeds & Ginger from the town of Kanchipuram.This idli's are Normally Served as a Breakfast Recipe. I am a big fan of this Idli.Traditionally Idli's are Cooked in dried stitched “Mandharai” leaves. The Mandharai leaves adds flavour of the idlis. Mandharai leaves are placed in Kudalai(cylindrical shaped hollow Bamboo rod), then spiced idli batter is Poured over it & steam Cooked for 2 hours. I Used tumblers to make this idli, with 20 minutes cooking time. Pepper seeds - 1/2 tbsp. Soak raw rice and idli rice together for 3 - 4 hrs. Soak urad dal just 1 hr before grinding. crush cumin seeds and pepper seeds coarsely. Grind soaked urad dal into soft & fluffy batter. 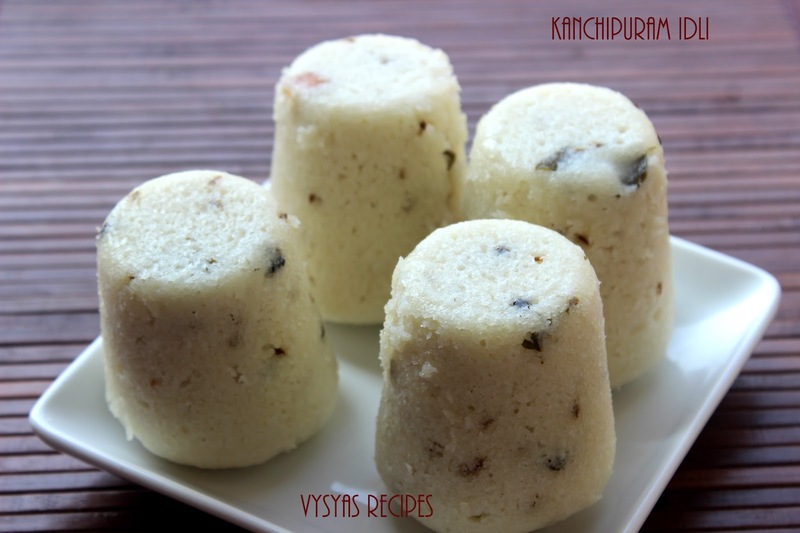 Grind soaked raw rice and idli rice together to a fine batter by adding little water. Take a kadai , add 3 tbsp of ghee when it is hot,add chopped ginger,crushed cumin and pepper seeds, curry leaves, chopped cashews saute for few minutes till aromatic, then pour it over idli batter.Mix well. Consistency of idli should be like our Normal idli batter. Take a tumbler, grease with oil,half fill the tumbler with batter. Take a idli vessel, pour 3-4 cups of water, place the tumblers in the idli bowl, [Normally we place 4 - 6 tumblers in it]. Allow it to steam for 20 - 25 minutes. Then l leave it as such for 2 minutes, then use knife to cut through it. Then turn the tumbler upside down to remove the idli's from tumbler. It Goes well with Onion Chutney.